← Yes !.. well, I mean No !.. ok maybe, Yes ? That’s a good thing, I think .. in my opinion any niche movement ( and yes Kaiju toys is a small slice of the toy pie in America ) needs to grow, have new blood and new events to keep things fresh and hopefully push the boundaries of what it can be. 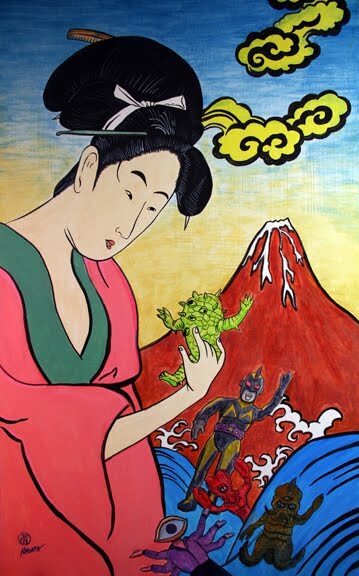 Going global was always part of my plan to expand Kaiju themed shows. Japan was obvious as the birthplace of these toys, and Chicago, Miami and San Francisco in the USA ( with more to come ) are in my native country but Kaiju Attack – Barcelona – Spain, and others in the planning are pushing forward into uncharted territories… I think a very exciting time for fans .. but also for the artists involved. Yes, the economy is tough, and it’s bad all around the world.. but it’s precisely in these times that if your able to support these artists (and Art) your actually keeping this art form alive and in many cases helping these artists survive. To be a toy maker or an artist is tough … ya there’s a few superstars out there, but for the most part we all plug along, selling our figures in the hopes of being able to do another, and another ;-P Glamorous ? nope ( sorry to burst your bubble ).. for me the drive is to not only express my toy vision, but also to expose some of these other artists and what they do. With the success of Kaiju Comrades 2 in Japan, and especially during these down times proved to me that great work will always sell when presented in the right way. So the buzz I hear or rather FEEL I hope means I’m on the right path. Plans are in place for 2011 and beyond.. and if we make it past 2012 ( ha-ha ), well you can bet Kaiju will be stomping ahead full steam !